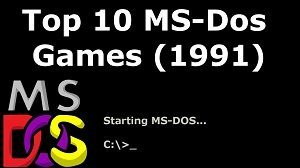 Come take a look at my top 10 best MS Dos games (From 1991) You can download and play now. I have selected what I consider to be the best ms dos games released in the year 1991. MS DOS doesn’t seem like a great platform for gaming (It was a text based operating system) But don’t let that fool you, There were some amazing games released which are still well worth a play today. The list below was put together by me, I have only included games that I have played and were released in the year 1991. If you know of any games I missed that should be in this list and were released in 1991 please post about it in the comment section below and I will mention that game in this post. Here is the list in reverse order, starts from #10 and ends at #1 🙂 The games I have listed are all games I have played. If you know of a MS DOS game that was released in 1991 which you think should be included here please post about the game in a comment at the bottom of this page. I will check out the game and will mention it in this article. Game Description : Duke Nukem is a 2D platform ms dos game developed and published by Apogee Software, featuring the adventures of the fictional character Duke Nukem. Your mission is to stop Dr. Proton, a madman bent on ruling the world with his army of Techbots. This game has some decent graphics and is still worth a play today. 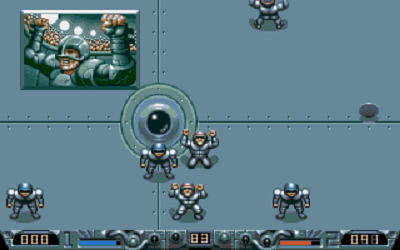 Game Description : Speedball 2 is a brutal futuristic sport where armoured teams face-off in a metal-clad arena with the aim of beating down their rivals and scoring goals for fame and fortune. The aim of the game is to score more goals than your opponent. Game Description : Fantastic Dizzy is developed by Codemaster and is part of a large dizzy series which spans many consoles and systems. 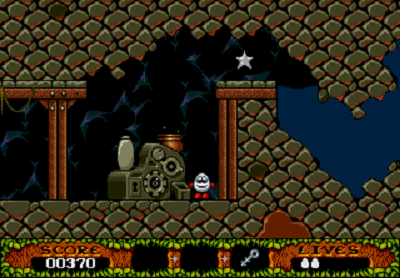 The main character Dizzy is an egg living in a world of magic and fantasy. The concept of the game is to move around the world, finding various items and collectables, and to use them in the right locations. Game Description : Leisure Suit Larry 1 in the land of the lounge lizards. 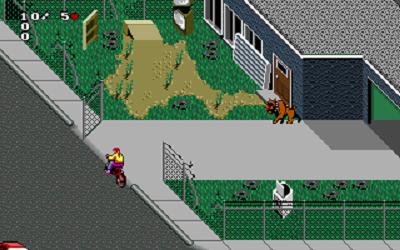 The game is a point and click game which was developed by Sierra online for MS DOS and was later ported to other platforms due to the game being a hit. Game Description : WWF Wrestlemania I love wrestling and I love this game. 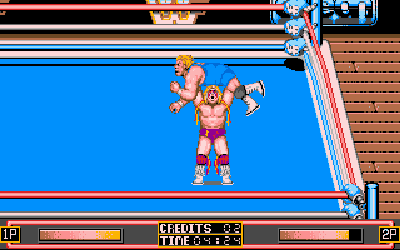 You can choose to play as 1 of 3 characters, hulk hogan, the ultimate warrior or the british buldog and must defeat 5 opponents to become wwf champion. Game Description : As you can probably guess the aim of this game is to deliver as many papers as you can. Sounds easy right? but the streets you are delivering on are littered with obsticals out to stop you from delivering your papers. Game Description : As a youngster I use to love playing this game in the arcades. When I heard this game was being ported to MS DOS I didnt expect much. But I was shocked the game is very simular to the arcade version. The simpsons arcade is a side scrolling beat em up which you can play with up to two players. 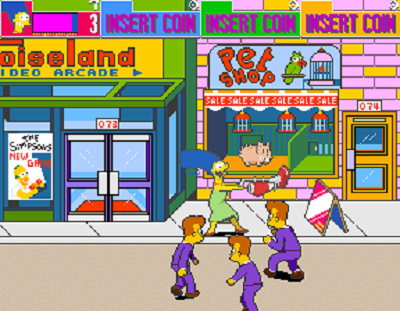 The playable characters are Homer, Marge, Bart and Lisa. Each player can jump and attack and two players can team up for a power joint attack for example homer and marge can join together to perform a powerful cartwheel. Game Description : I was blown away with the cut screens and graphics in this game, It was the first time I saw anything like it, They were so advanced for there time. 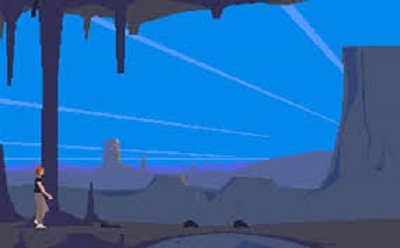 another world had 2 sequels “Flash back” and “Fade to black” but many people consider another world the best game in the series. this game is a puzzle solving futristic platform game. The character you play gets teleported in to another world when lightning strikes hes place or work where he is conducting experiments. in another world you alley with an alien who helps you through the game. you must evade many dangerous enemy’s to progress. This game is very hard, but is also very rewarding and will keep you coming back for more. This is classed as one of the best abandonware dos games you can download and play today. Game Description : The number 1 Best MS Dos Games is,,,,,, monkey island 2 lechucks revenge. This game is still to this day one of my most favourite games. The game is so popular that it has recently been re-released on playstation 3 and xbox one. 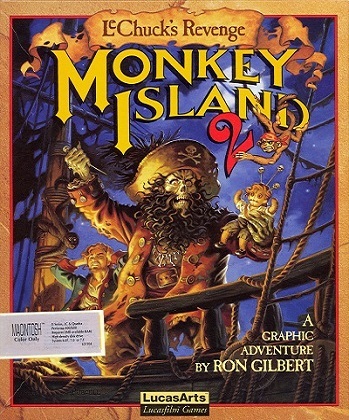 Monkey island 2 is a MS DOS point and click game where you control a pirate called guybrush who is after the treasure of big whoop. In the first monkey island game guybrush kills a well known pirate called lechuck, and in the spirit of monkey island guybrush accidentally resurrects lechuck who is after revenge. This game takes place on new islands and during the game you can explorer several islands simultaneously. This game is considered to be very hard to finish, but there is also an easy setting which makes the harder puzzles a little easier to solve. Monkey island 2 is simply the best dos adventure games of all time and is a game which everyone needs to play once. That completes my top 10 Best MS Dos Games that were released in 1991. I hope you have enjoyed reading this list I have put together. If you think I have left out any top MS DOS games that were released in 1991 please post about it in a comment below. DosBox is basically an emulator which runs on your windows machine. 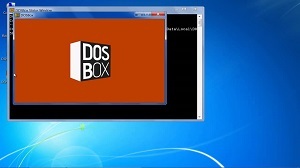 I have also created this video which shows you how to install DosBox and play the Best MS Dos Games on your machine.